The Bill Tracy Project - Biography - Outdoor Dimensional Display Co., Inc. 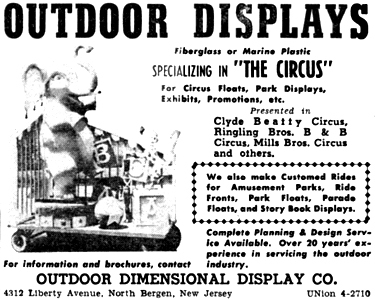 Outdoor Dimensional Display Co., Inc.
Bill Tracy’s earliest known project was Jungleland at Hunt’s Pier in Wildwood, New Jersey. This jungle-themed water ride opened for the 1959 season and was a joint venture with Allen Hawes and Jamie Sanford. One of his next projects was the Golden Nugget Mine Ride, also at Hunt’s Pier in Wildwood, New Jersey. This rollercoaster-style dark ride opened for the 1960 season and was a joint venture with the Philadelphia Toboggan Company. 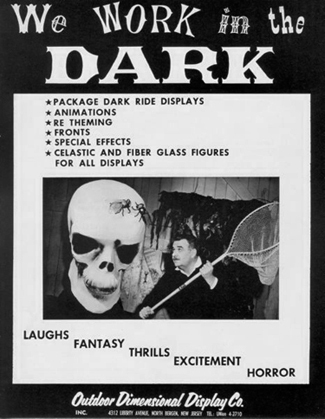 Bill’s first dark ride company, Outdoor Dimensional Display Co., Inc., was formed around this time and was an independent company that used the same techniques, fluorescent paint and ultraviolet lighting that he used for Bamberger’s Parade. In the April 11, 1960 issue of The Billboard, an ad for O.D.D. 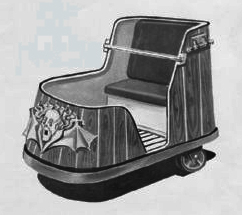 appeared for the first time which promoted circus-related outdoor displays, but also noted that they built custom rides and ride fronts for amusement parks. Needless to say, Bill Tracy did it all at this point. At Olympic Park, located in Irvington, New Jersey, he even created fish bodies for the old airplane swing, which was appropriately renamed “Flying Fish”. O.D.D. ad promoting circus-related outdoor displays, as published in the April 11, 1960 issue of The Billboard. O.D.D. was a new company and Bill Tracy needed all the help he could get in promoting and marketing the services that he provided. In 1960, Bill hired Richard D. McFadden, a manufacturer’s agent and park design consultant, to represent O.D.D. in an effort to generate more business. McFadden was previously associated with the Allan Herschell Company for a few years as a salesman. After his resignation from that company, he started his own business in the state of New York. In the April 11, 1960 issue of The Billboard, an ad for McFadden’s new business appeared listing O.D.D. as one of the manufacturers that he represented. In the early 1960s, Bill was doing all that he could to ensure that his business would be a successful one. 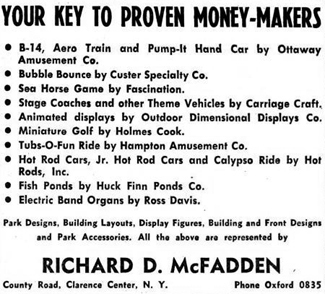 Richard D. McFadden ad promoting his business and O.D.D., as published in the April 11, 1960 issue of The Billboard. In 1961, Bill continued with advertising campaigns and went to NAAPPB (National Association of Amusement Parks, Pools, and Beaches) conventions trying to promote his new company. 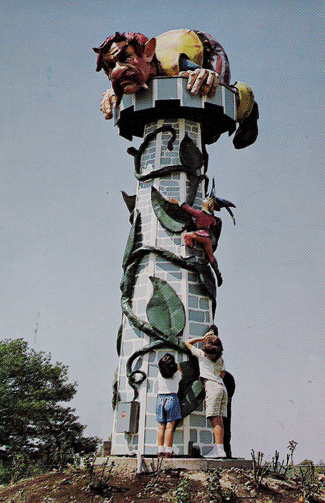 Smaller projects, such as Jack and the Bean Stalk within the Garden of Fables section at Fantasy Island in Grand Island, New York, as well as some of Bill’s most famous rides, such as Whacky Shack at Joyland Amusement Park in Wichita, Kansas and The Haunted House at Trimper’s Amusements in Ocean City, Maryland, were contracted after meetings that took place at these conventions between the park owner and Bill. The final contracts were often signed at Bill’s office. In the early 1960s Bill Tracy was being recognized as a significant contributor to the amusement park industry. Outdoor Dimensional Display Co., Inc. was honored with the Fred W. Pearce Sweepstakes Trophy at the NAAPPB convention in 1961 and 1962. The NAAPPB is known today as the IAAPA (International Association of Amusement Parks and Attractions). Tracy’s defunct Jack and the Bean Stalk at Fantasy Island in Grand Island, NY. In 1962 O.D.D. released its first official catalog. This sixteen page catalog entitled We Work in the Dark included many stunts with descriptions and several completed projects showcasing the façades. Manfred Bass, one of the first sculptors that Bill hired, recalled that the title of this catalog was a reference to the motto of his fluorescent workshop. 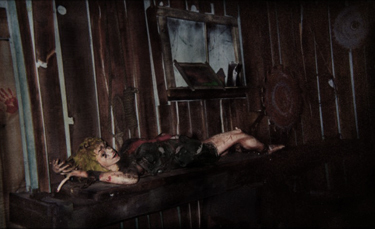 The Tracy gang actually did “work in the dark” when painting stunts and props so that the final product was seen in the proper environment, under ultraviolet lights. This catalog also included a full price list. In 1962 an average stunt cost $1,500 and a complete two-story package dark ride cost approximately $40,000 in addition to the cost of the building structure itself. On average, a dark attraction took only a few months to build. Cover of 1962 O.D.D. catalog entitled We Work in the Dark. During this time, Bill’s new company was taking off and signed project proposals started piling up on his desk from parks all up and down the East Coast. His company and workshop were based in North Bergen, New Jersey, which is directly across the river from New York City. Bill ran the business, worked in the shop, and spent a lot of time at the various amusement parks supervising and participating in the installations, along with developing strong business relationships with the park owners. Sometimes he would be on-site for a week or two at one park and then travel to another installation. Bill’s company not only designed new dark rides, walk-thru funhouses, and kiddie dark rides, but also made famous the practice of re-theming already existing dark rides. For example, he would take an old Pretzel-built ride, like Devil’s Cave at Dorney Park in Allentown, Pennsylvania, and re-theme it into Pirates Cove. Or he would convert an old mill chute ride, like the Mill Chute at Idora Park in Youngstown, Ohio, and re-theme it into Lost River. Re-theming was popular because it maximized the profit potential of a new ride. Even though it was considered a new ride, the infrastructure of the previous ride was retained, therefore, minimizing the overall investment. Bill would also re-theme his own rides from time to time and was very efficient and creative at converting non-profitable spaces such as ballrooms, skating rinks, and basement storage facilities into profitable attractions. In essence, he could turn something into nothing and as a result gained the reputation as “The Wizard of Worst Case Scenarios”. When he designed a new dark ride, it would consist of an elaborate façade, interior stunts and props, and a ride system to carry riders through the alternate world that he created. 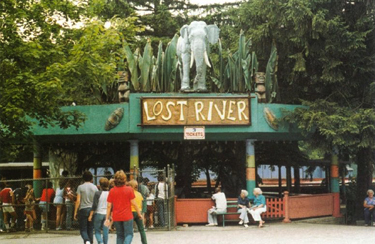 Tracy’s Lost River at defunct Idora Park in Youngstown, OH. Bill believed that the façade of a dark ride was equally as important as what was inside it. The façade was the marketing and advertisement for the ride and hopefully lured a person to use some of their precious ride tickets on that particular attraction. This design strategy was definitely apparent as no other dark ride designer of the era developed such decorative and complex façades as Bill. The interior stunts of this era, the early to middle 1960s, were more complex mechanically than in later years. During this time, most of the stunts were triggered “events”, such as a female victim being cut in half by a large circular saw. These stunts had complex mechanical systems to achieve the animation, Amuse-pak sound cartridge repeaters to create the sounds, and timed lighting to bring the stunts out from the darkness. All of these mechanical systems had to be custom fabricated for each stunt and also had to be discreet as to not take away from the ingenious artistry of the stunt itself. Bill was often criticized for being a substandard engineer, but in reality, the engineering of his stunts was quite good. The stunts worked well, just not as long as park owners would have hoped. Most of his stunts lasted only a few months and then had to be rebuilt. The flaw was not necessarily in the mechanics of making the motion needed to bring the stunt to life, but in the durability of the materials, pumps, and motors used. These stunts were also put through very rigorous use as they had to operate hundreds, if not thousands, of times per day. Maintenance was often not kept up properly by park workers and vandals were constantly damaging stunts that inevitably affected the way they would operate. Trimper’s Amusements in Ocean City, MD. The stunts Bill Tracy created in his early years were often very brutal and sexual in nature. He pushed the limits of what would be acceptable at a family-oriented amusement park. Bill often portrayed women in compromising situations and became known for including every detail of the woman’s body in his designs. He would often animate a woman’s chest to show that she was breathing heavily because of the terrifying situation she was in. He also never held back with representations of gore and worked with the philosophy that the only way to truly convey the emotions of his characters was to exaggerate the facial expressions. Nothing could be subtle as the rider may only have a few seconds to view a stunt before the lights would go off and they would be taken off to the next stunt. For the ride system Bill would either use his own ride system or partner with a manufacturer such as the Allan Herschell Company. 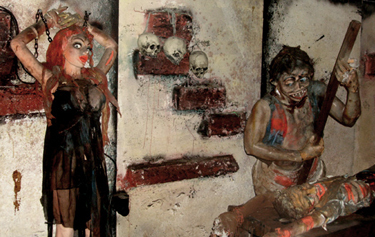 The Allan Herschell Company provided the ride system for The Haunted House at West View Park in Pittsburgh, Pennsylvania. Regardless of what ride system was used, “bang doors” were always an essential part of Bill’s dark rides. The car banging through the double doors made a loud sound that startled the rider and added to the overall sound effects of the ride. Allan Herschell dark ride car in the 1963 O.D.D. catalog entitled The Haunted House. He continued advertising campaigns promoting his company, O.D.D., in publications such as Amusement Business through 1963. Some of his advertisements were very creative and included Bill dressed up in costume as a character in one of his own stunts. This gives some insight into the type of person that Bill was and shows that he probably had quite a sense of humor. Bill Tracy, by all accounts, had an outgoing and flamboyant personality. O.D.D. 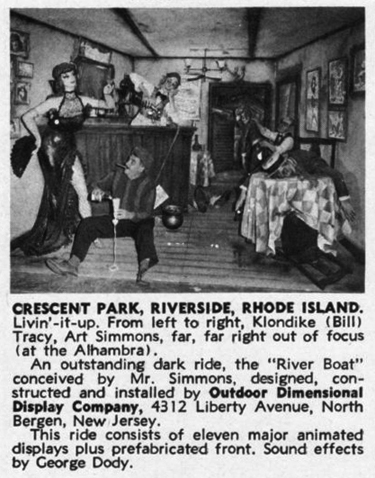 ad featuring Tracy in one of his own stunts, as published in the July 7, 1962 issue of Amusement Business. By the end of 1963, Bill failed to keep up with taxes, which caused his business to unravel. At this time Bill was still under contract with Macy’s to build parade floats. One night, because of his unpaid taxes, the government took action and locked up his workshop in North Bergen. The next morning when his employees showed up for work they were not able to enter the workshop. Bill was instructed by Macy’s to remove everything from the workshop and Macy’s helped him find another warehouse to store their floats. This event signaled the end of Bill Tracy’s relationship with Macy’s. O.D.D. 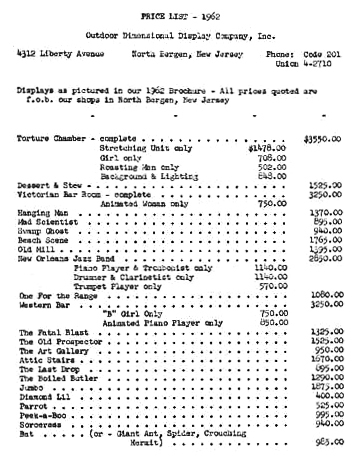 price list for 1962.